Classical linear regression estimates the mean response of the dependent variable dependent on the independent variables. There are many cases, such as skewed data, multimodal data, or data with outliers, when the behavior at the conditional mean fails to fully capture the patterns in the data. Can be used to study the distributional relationships of variables. Is useful for dealing with censored variables. Is more robust to outliers. where $\tau$ is the quantile level. Each orange circle represents an observation while the blue line represents the quantile regression line. 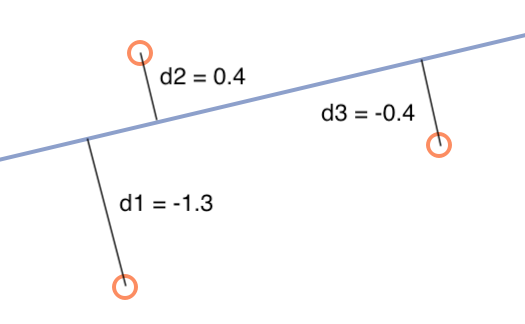 The black lines illustrate the distance between the regression line and each observation, which are labelled d1, d2 and d3. Optimizing this loss function results in an estimated linear relationship between $y_i$ and $x_i$ where a portion of the data, $\tau$, lies below the line and the remaining portion of the data, $1-\tau$, lies above the line as shown in the graph below (Leeds, 2014). In the graph above, 90.11% of the observations are below the quantile regression line which was estimated with τ set to 0.9. Today we will use the GAUSS function quantileFit to estimate our salary model at the 10%, 25%, 50%, 75%, and 90% quantiles. This allows us insight into what factors impact salaries at the extremes of the salary distribution, in addition to those at quantiles in between those extremes. String, name of data set. String, formula of the model. E.g "y ~ X1 + X2"
Optional argument, Nx1 vector, containing observation weights. Default = uniform weights. Optional argument, an instance of the qfitControl structure containing members for controlling parameters of the quantile regression. We can see in the table of our results that both the magnitude and intensity of the coefficients on our predictors' changes across the quantiles. The magnitude of impact that Hits has on salary decreases as players' salaries move from the 10% quantile to those in the 90% quantile. 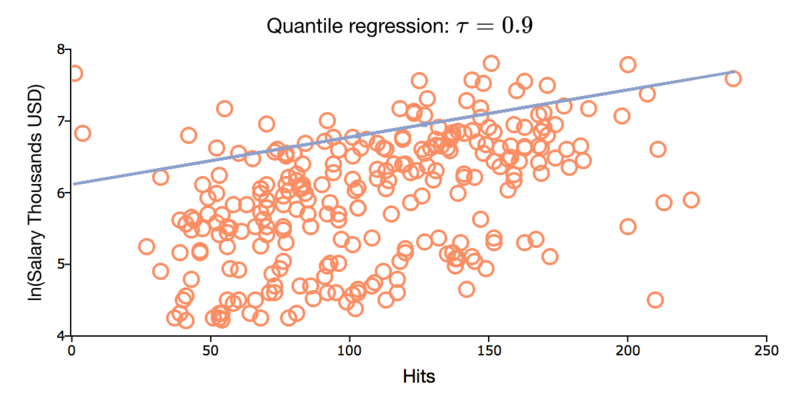 Hits is less statistically significant for the 90% quantile than lower quantiles. HmRun is only statistically significant for the 75% and 90% quantiles. This suggests that players with the highest salaries aren't necessarily paid to just hit balls but rather to hit home runs. This paints a nice picture. However, it is inappropriate to make any conclusions without first considering how statistically significant these differences are (Leeds, 2014). 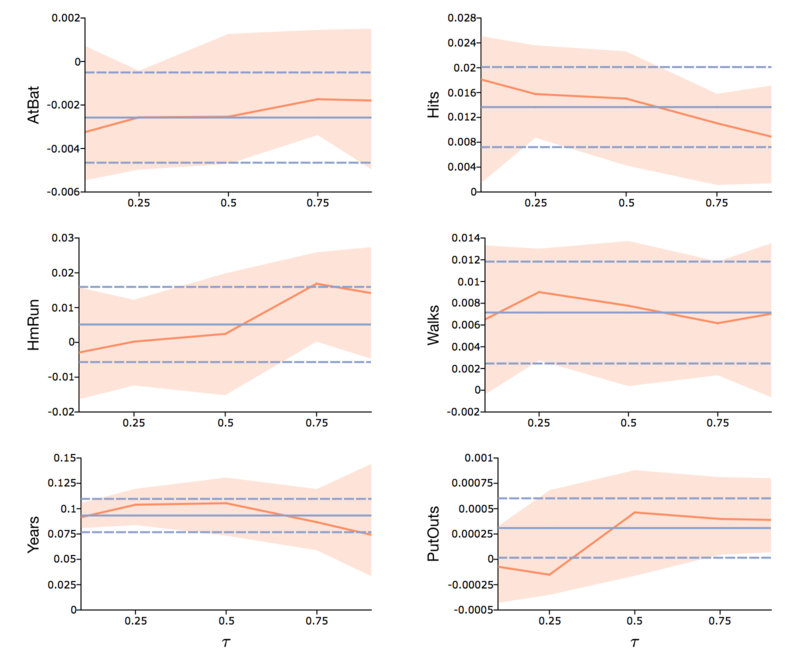 The quantile regression parameters and confidence intervals are in orange. The blue lines represent the OLS coefficient estimates and 95% confidence interval. The graph above provides a visualization of the difference in coefficients across the quantiles with the bootstrapped confidence intervals. It also includes the OLS estimates, which are constant across all quantiles, and their confidence intervals. From this graph, we can see that OLS coefficients fall within the confidence intervals of the quantile regression coefficients. This implies that our quantile regression results are not statistically different from the OLS results. The intuition of quantile regression. 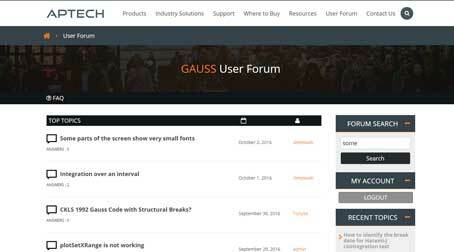 How to estimate a quantile regression model in GAUSS. How to interpret the results from quantile regression estimates. Leeds, M. 2014, “Quantile Regression for Sports Economics,” International journal of sport finance, 9, 346-359.